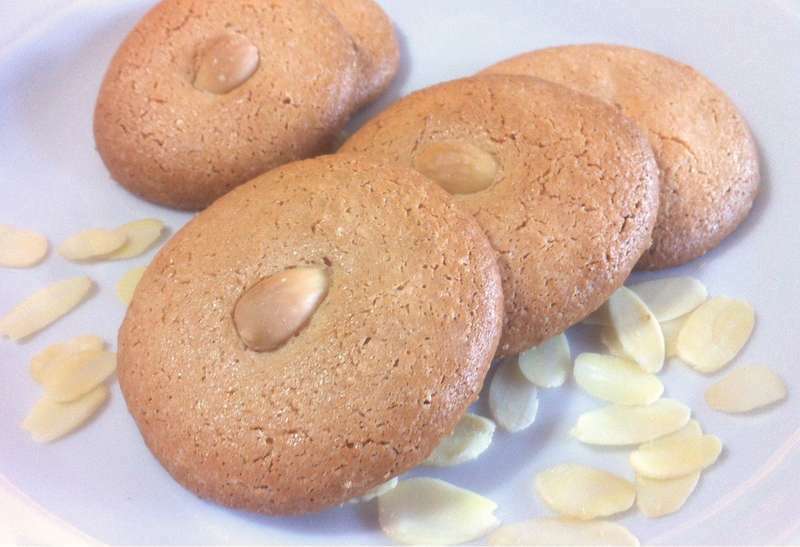 Greek almond cookies recipe with only three ingredients, 5 minutes prep making 30 amazing cookies! You just can’t go wrong with this recipe! ‘Ergolavi’ (Greek almond cookies) is a beloved traditional treat – the Greek version of macaroon, only much easier. Crunchy on the outside, soft and chewy in the middle with an incredible almond-y flavour.. Enjoy this amazing Greek almond cookies recipe over a hot cup of coffee and a full spoon of your favorite jam! To prepare these super easy Greek almond biscuits, add the raw almonds and sugar in a food processor and blend until powdered. Add the egg whites (and the vanilla extract) and pulse, until the ingredients combine, forming a firm paste. Layer the bottom of 2 baking trays with parchment paper and form the cookies. Take approx. 1 1/2 tsp of the paste and place on the baking tray; repeat with the rest. Garnish with whole almonds or almond silvers and wait for a while for the dough to spread on the tray. If you like, shape the cookies using a pastry bag. Bake in preheated oven at 160C for 17-20 minutes, until light golden. Be careful not to over bake them. Enjoy hot from the oven with a full-spoon of your favorite jam! These cookies are very thin and liquidy. Plus, it’s almost impossible to get them off the tray, giving you very ugly cookies. When I prepared them (check photos above) the paste was thin but not too thin as to spread out. The eggs must be fresh so that the meringue formed while beating in the processor will act as a thickening agent. Also parchment paper should allow you to lift them off nicely from the baking tray using a thin spatula with a sharp move. If you would like them to be less chewy and more stiff, you could blend the ingredients without the egg whites and half the sugar and whisk the egg whites with remaining sugar to a stiff meringue. Then mix them using a spatula till the mixture is uniform. That would make for a firmer mix, very similar to macaroons. Hi, In England we put these macaroons on rice paper ( which is edible) and however thin the mixture was before they go in the oven doesn’t matter, they always taste great!